Ursaja has 8 colors : blue, green, bittersweet, yellow orange, denim, teal, violet, watermelon. You can choose one color you like to show in your template. It is furesponsive lly and supports CSS3 to highlight your site. The highlight in the homepage is the slideshow ( banner sequence and banner7 extension) . It is full for window, and auto play with large images, title, description, thumbnail images. Addition, in the homepage show featured products, new products in slider, onsale products in slider. Advertisment is supported more powerfully by static blocks with nice images and theirs information. 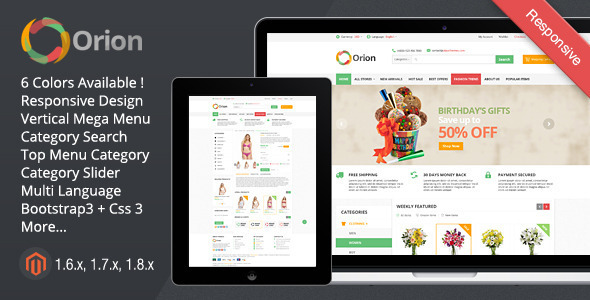 Other extensions in your template are : layered navigation ajax, ajaxcart super, upsell slider, vertical menu, custommenu, prozoom,..
Aquila is a responsive magento theme, extremely customizable, easy to install and use. This theme is a special design for selling mobiles, phones, digital,.. Homepage contains image slideshow, brand sliders; the footer with extra space allows to show more info of your stores address or links. If you are looking for a professional, modern magento theme to give your store a fresh new look – Buystore magento theme is a great choice for you. Buystore multi store theme bring you many choices for selling lingeries, fashion, sportwear, mobiles and accessories,..